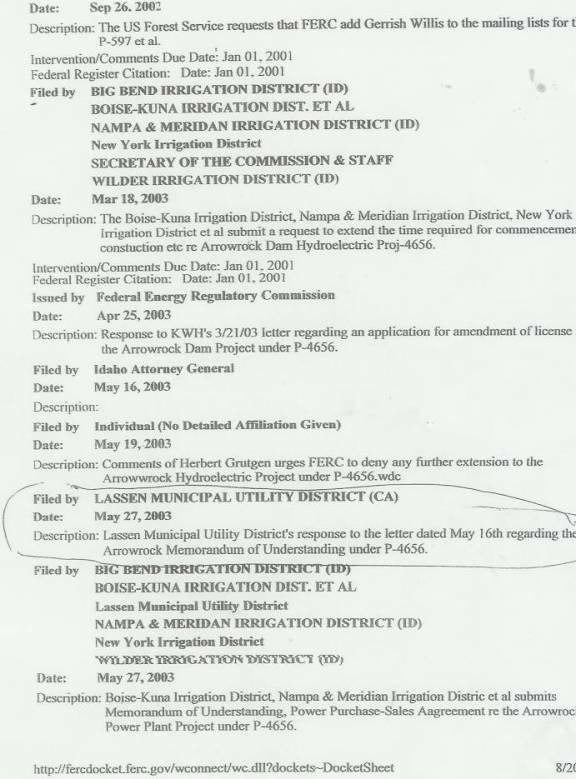 This document was printed from the FERC website. LMUD is required to report, to the public, any action taken in closed session. The LMUD Board reported no action will be taken on Arrowrock, at their May 2003 meeting and then proceeded to instruct Frank Cady to file an action in regards to Arrowrock with the Federal Energy Regulatory Commission. This isn't the first time LMUD has not reported closed session action. LMUD instructed Frank Cady to take action against KWH at their September 4, 2003 closed session and did not report this to the public. LMUD instructed Frank Cady to file a "Motion to Intervene" on PG&E license P-2105. This action was in relation to LMUD's recreational interests ??????? This was also done in closed session and not reported to the public.